As we enter the last quarter of the financial year, minds are turning to that (let’s be honest – often awful!) task of reporting on your organisation’s work and impact over the past year. The importance of reporting is manifold – accountability to stakeholders, compliance with law, transparency, gaining sustainable funding – there are lots of drivers. It’s hard work and can often result in little return – but it doesn’t have to be that way, and there can be real benefits from the process. Before jumping in, take a moment to reflect on why you are reporting in the first place and who your audience is. In many organisations, reporting is often little more than a compliance exercise, expensive in cost and practically non-existent in impact. We’ve seen organisations conduct work that’s taken months to produce, costs thousands (if not hundreds of thousands), goes nowhere and is read by almost no-one. That’s a huge amount of wasted effort for a document that, while certainly required, could have provided much more value. Clarity from the beginning ensures that you avoid reporting for reporting’s sake, enabling you to direct your resources in the right direction. Why are we creating this report: compliance? Someone asked us to? Just something we’ve ‘always done’? Who is going to read it? Who do we want to be reading it? How will we use it? Will it help us achieve our goals? How will we share it? 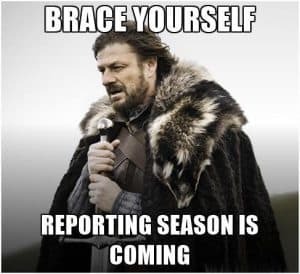 You’ve finished your report! It’s been designed up, looks great and it’s on your website…but what now? We can’t emphasise this enough: it’s not about the document, it’s about the process you go through to produce it. That’s the real value – the questions asked, the data gathered and analysed, the insights fed back into your organisation’s strategic planning. Good reporting ensures that such value is extracted along the way. We see many organisations focusing on a reporting timeline that’s built around producing a document – working back from when we plant to print the report or publish the PDF online. Instead, think holistically about your organisation’s strategy cycle and where the work fits your overall flow – if we’re going to collect case studies for the report, can we use them to inform a best practice sharing session internally? Are there lessons learnt we can collate for a Board meeting? Timing is an important factor here – make sure you start early enough to sync with your organisation’s strategic planning cycle. That way, insights from reporting will feed into strategy without a time lag (since you’re already looking retrospectively). This can be of particular value in small organisations, which won’t have as many inputs into strategic planning as larger organisations, without such a large budget. We’ve seen great reporting support not-for-profits in gaining and maintaining funding from corporate and government partners. Similarly, we’ve seen corporates reap noteworthy reputational benefits from good quality reporting. There’s lots of different reporting flavours and recipes out there. From international frameworks like the Global Reporting Initiative and Integrated Reporting, all the way to specific impact measurement approaches likes Social Return on Investment and Results Based Accountability. Just like thinking through your why and your audience, don’t get hung up on a particular approach – do what’s right for you. Work backwards from the end, thinking through the best way to approach telling your unique story. There might not be a single formula or framework, but rather a mix of a few, with some creative elements too. Narrative storytelling is increasingly used, as traditional Annual Reports tend to be dry and data heavy. Here’s some great ideas for not-for-profits; for corporates check out this reviewed list of 15 best practice reports as inspiration. Ensure that your stakeholders understand how you’re moving towards achieving your organisation’s big picture – your vision or mission and/or how you’re mitigating risks.It sounds simple, but can someone who picks up your report quickly understand why you exist as an organisation? What problem you’re trying to solve? Or in the case of a corporate business, how you’re using CSR to mitigate your risks? All too often we see reports where you can’t tell what the company does until you’re 10 pages in. So be upfront about it: this is what we do, how we do it, why we do it – and this report will update you on how we’re traveling. For corporates, a great idea is to undertake a materiality process. This considers how to draw out the most material issues (meaning, most important in terms of impact to the business and to stakeholders) as the focus for reporting. Rather than reporting on everything – a long list for a big business – this process elevates the most important and relevant issues, helping to create clear links between strategy, risk mitigation and social impact. For not-for-profits or social initiatives, it’s useful to build your reporting out from your Theory of Change, e.g. why what you do is making a difference to solving a social issue. When you clearly understand the end goal you’re trying to achieve, that’s your North Star to guide your report writing. For corporates – don’t have a materiality assessment? Here’s how to get started. For not-for-profits/social initiatives – don’t have a Theory of Change? Here’s a great guide. 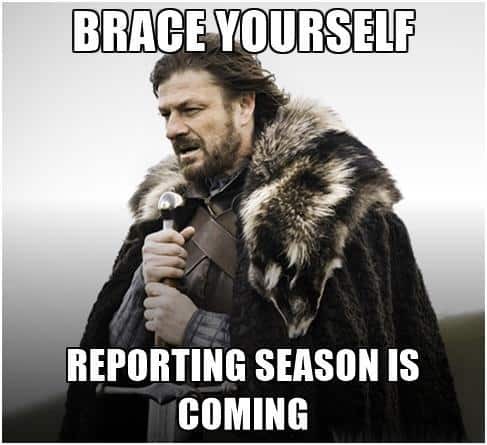 Reporting is often the task that nobody wants to do. In your organisation, is it left at the bottom of the pile, delegated to the most junior person or palmed off onto another department? This is a mistake – you lose value and waste energy and resources. Alternatively, you could be adding value rather than grinding out a compliance document. Finding the right person for the job is crucial. A lot of organisations assume that anyone who knows how to write a few sentences can do your reporting, but if you have someone on it every year simply as a compliance exercise, then all you’re getting is a compliance document. You don’t get all the added value of a strategic document, which is the main reason to do it in the first place. Don’t get your communication or marketing team to do it, get somebody who’s close to the data and/or the project. Certainly, someone can help shape the writing, but it’s primarily about getting the right technical knowledge in there. If you’re a not-for-profit, seek funding for reporting – funders are increasingly willing to finance this sort of work. Don’t just ride out the winter writing away on your own, take some time to ask yourself the right questions up front and you’ll be on track to a much more valuable reporting experience. We can help you plan or execute your report, whether it’s on corporate sustainability, evaluating a social initiative, or an impact report for your not-for-profit. Get in touch with us at info@sparkstrategy.com.au. To learn more about developing better partnerships for social impact, download our whitepaper, Partnering for Purpose.